The Megapolitan Flâneur is a series of short travel essays. 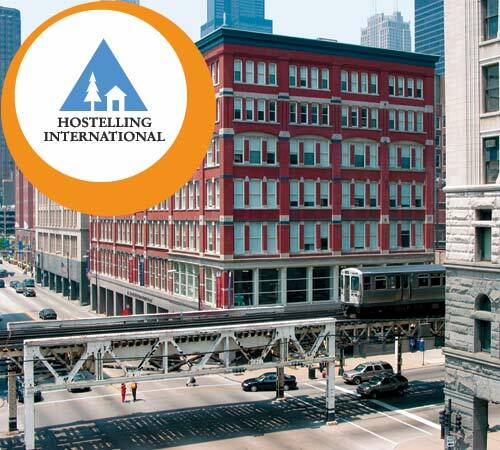 These essays will focus on my trip to Chicago – September 4 – 6, 2013 – and what I experienced. Neither chronology or inventory, the essays will be reflective, free associative, and impressionistic. Full Disclosure: I am a staff member and assistant editor for the Chicago Center for Literature and Photography (CCLaP). While I did wander and amble throughout Chicago, this was a “working vacation” for me. After a hearty Continental breakfast at the International Youth Hostel downtown, I headed to the Red Line station on Jackson. Today (September 5th, the same day as the Quimby’s show), I would head down to Jason’s apartment for a crash course on bookbinding. During those hours, punctuated by a lunch at a nearby coffee shop, Jason taught me about the craft of bookbinding. The Chicago Center for Literature and Photography is a strange hybrid, simultaneously old and technologically cutting edge. Every CCLaP book comes in two formats: a limited edition handmade hardcover book (usually priced around $20) and an ebook available as a free download. What I experienced with Jason’s mentorship was a combination of tedium, process, muscle memory, and artisanship. Tedium may sound pejorative, but in this case it wasn’t. Since I was a newbie, I struggled to get the process down. This involved me paying attention to every step every time I did it. Back to the books: After printing out a pile of standard size sheets of paper (8 ½ x 11), Jason cut them in half with a paper cutter. I then started folding pages in half. Eight folded pages came together as a signature. Prior to the printing, Jason worked out the proper layout for text, page numbers, etc., so the cutting, folding, and stacking of signature pages would make sense. After putting the signatures together, Jason poked holes in one end of the signature with an awl. Following that, he showed me how to knit together signatures. 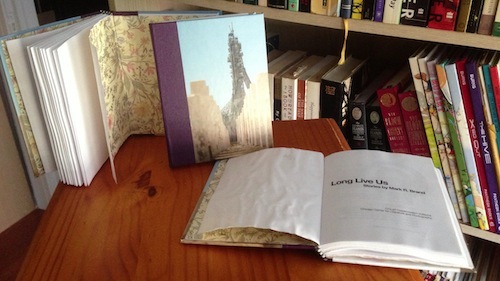 (We were assembling early versions of Mark Brand’s book, Long Live Us.) The multiple signatures stacked on top of each other started to look book-like. Even more so once they were all knitted together. I learned the basic knitting, although Jason told me about the tricky Coptic knitting. Once the signatures were knitted together, I slathered on book glue and placed a sheath and two headbands on the book. The most challenging part came after I glued the cloth lining on to the text-block. I had to align the glued text-block to the hardcover backing boards. While CCLaP prides itself in its individualized homemade look, I had to keep things properly squared or else it would look like crap. Yes, Virginia, people do judge books by their covers. I wanted to make sure I represented CCLaP in the best way possible, despite my bookbinding inexperience. It had to look homemade, but not amateurish. Consumers would spot that right away and move on to the next book on the shelf. With short attention spans, an ever-ready smartphone, and fickle tastes, every second counts. How do you make the consumer linger over your product? The longer they look, the greater the possibility they will buy the product. But without consumer testing, focus groups, and all the trappings of large-scale corporate marketing departments, CCLaP relies on its product to exhibit itself for what it is: a high-quality handmade book in a limited edition. Going back to the Walter Benjamin quote, the bookbinding process was a ritual. The end product was a handmade object. In today’s gentrifed world, we value our artisanal cheeses, craft beers, and so on. The CCLaP Hypermodern Editions represent a hybridized version of this, since the text is mass produced on a standard printer. But these mass produced pages are placed into a handmade structure. In terms of process, my bookbinding experience represented only a small series of sub-routines within the entire book-making process. First steps involve culling the slush pile, signing the author, and possibly major structural editing. (There’s another multi-stage editing process at this point, including multile re-readings under different circumstances.) Then Jason uses InDesign for layout, page numbering, etc., and final conversion into multiple formats (EPUB, MOBI, PDF). Then CCLaP’s army of proofreaders do a final check for misspellings, dropped words, and so forth. Remember: the book hasn’t even been printed yet! That afternoon I placed text-blocks within the hardcover backings. Prior to this, Jason had to construct these hardcover backings himself. This is another multi-stage process. 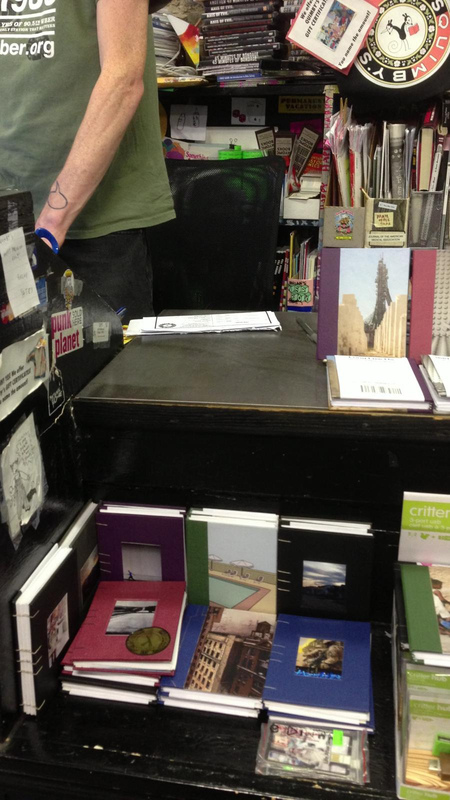 Suffice to say, the actual bookbinding process is done mostly by Jason, making it literally a one-man operation. Hence the delays with On Being Human, my anthology of essays. In addition to the time-consuming process of bookbinding, On Being Human is, in a positive sense, a victim of CCLaP’s recent success. After hiring a full-time marketing and promotions person, CCLaP has seen growth in book orders and publicity. CCLaP’s slush pile gets larger and larger and an increasinly larger network of CCLaP-affiliated bookstores send in orders. Right now, CCLaP is at a crossroads in terms of production capabilities and exposure to potential consumers. 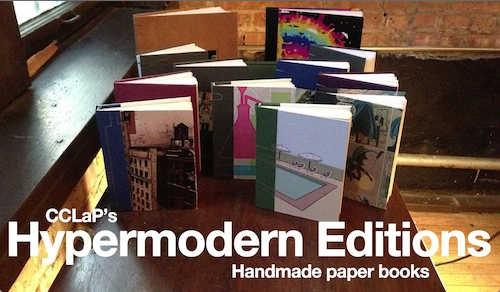 Will CCLaP’s handmade books remain a viable and sustainable option as demand increases? Stay tuned to find out more. Up next: I buy a $10 ring from a street vendor and I have a $10 martini at the Congress Plaza Hotel.